Officials said the smuggling went through two primary Midwest locations, Chicago and Detroit, and involved several men with ties to Jordan, Yemen, Lebanon and other Middle East countries. There is no evidence that any of the money was connected to the Sept. 11 terrorist attacks, officials said. Pseudoephedrine is used in some popular cold and allergy medications. It is an essential ingredient in the creation of methamphetamine, a powerful and increasingly popular drug known on the streets as "ice," "poor man's cocaine" or "crystal meth." Users generally inject or smoke meth. The powdery substance is produced by heating about a dozen chemicals. The U.S. drug ring was reselling pseudoephedrine to Mexican-based drug operations in the Western United States that used the pseudoephedrine to produce methamphetamine, authorities said. The Middle Eastern men then were diverting some of the proceeds from the pseudoephedrine sales back to the Middle East to accounts authorities have begun to connect to terrorist groups, DEA officials said. Some of the connections involved the Iranian-backed terror group Hezbollah, and some of the money has been traced to accounts in Lebanon and Yemen, officials said. DEA officials said U.S. authorities don't know yet how much money was funneled from the drug sales to the terrorist groups, but said the pseudoephedrine sales alone amounted to millions of dollars. "A significant portion of some of the sales are sent to the Middle East to benefit terrorist organizations," Hutchinson said. The drug ring was broken up Jan. 10 as part of a massive DEA investigation called Operation Mountain Express, which has smashed several major methamphetamine operations in the last two years. Arrests were made in Detroit, Cleveland, Chicago, Phoenix and several California cities. 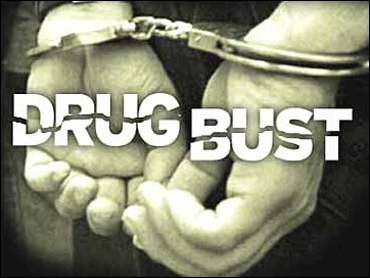 The raids have resulted in criminal charges against 136 people and the seizure of nearly 36 tons of pseudoephedrine, 179 pounds of methamphetamine, $4.5 million in cash, eight real estate properties, and 160 cars used by the drug gangs. Hutchinson has been warning for months that illegal drug money provides a compelling opportunity for terror groups to siphon support from the United States, but the DEA investigation provided the first evidence of a direct flow of money. The evidence of the terror ties emerged after the arrests. U.S. authorities said it is possible some defendants charged with drug violations could face additional charges. The Bush administration has been stepping up efforts to stem the flow of money and items from sympathizers in the United States to foreign terror groups under a law that prohibits providing "material support and resources" to known terrorist organizations. Six men who lived in the United States were indicted last week on charges they conspired to provide such support to al Qaeda or related terrorist causes. "The money mechanisms being used to aid terrorism are limited only by your imagination," said one senior law enforcement official involved in the effort. "There is a significant amount of money moved out of the United States attributed to fraud that goes to terrorism." The official spoke only on condition of anonymity because most of the details remain sealed as part of a grand jury investigation. The official said the early evidence suggests that groups like Hamas and Hezbollah benefit far more from U.S.-based funds than Osama bin Laden's al Qaeda network.